Quinoa is seriously one of my favorite things and it pains me when people refer to it as “boring”. But then I think back to the first time I made it. I simmered it in hot water (because I didn’t know any better) and yeah. That… was pretty humdrum. 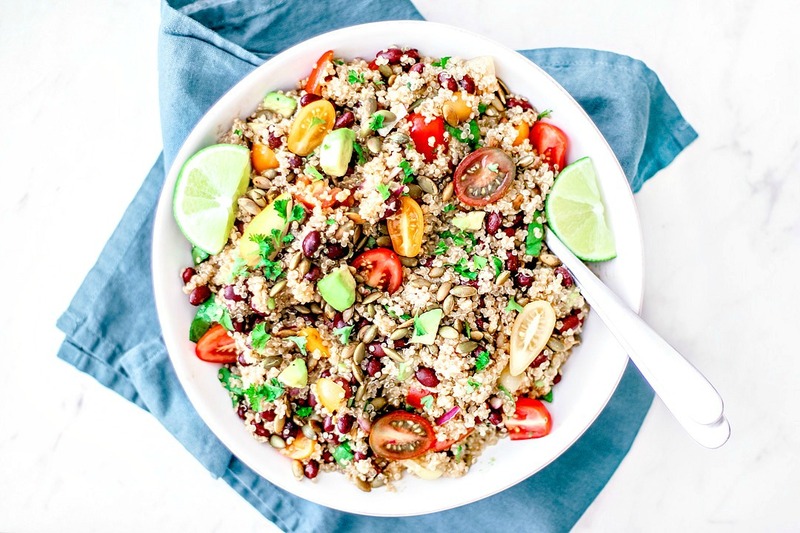 Whether you’re a newbie with this grain, or simply a skeptic with a few bad experiences under your belt, I’m confident this quinoa and black bean salad will change your mind. It’s chockfull of healthy goodies and fantastic textures, and it’s tossed in a smokey chipotle vinaigrette—one that always leaves me drizzling it over everything I eat for dayyyys. I like making a batch of this good stuff at the beginning of the week and keeping it in the fridge for an easy summer side, a substantial lunch, or a mid-afternoon snack. It’s not uncommon for me to stroll to the fridge with a spoon and just stand there, shoving this good stuff into my pie hole, unashamed. The best part? With wholesome quinoa and heart-healthy goodies like black beans, avocado, spinach, and pepitas, this salad is as good for you as it is flavorful. You will end up with some leftover dressing, but hey. That’s just an added bonus. Go ahead and make some killer salads with it, cook chicken in it, drizzle it over tacos… whatever your little smokey chipotle-loving heart desires. Wholesome quinoa and heart-healthy black beans are brought together in this nutritious salad with avocado, tomatoes, pepitas, and a smokin' chipotle vinaigrette. Place quinoa in a mesh strainer and rinse the grains thoroughly. Transfer the quinoa to a medium saucepan and toast the quinoa over medium heat for a minute or two. Add the vegetable broth to the saucepan, then sprinkle in the garlic powder, cumin, coriander, and salt. Stir the quinoa to give it a quick mix and bring it to a boil. Once boiling, reduce the heat to low. Cover the quinoa and let it simmer until it's tender and most of the liquid has been absorbed (about 15 to 20 minutes). When it's done, fluff it with a fork and set it aside. Add all if the ingredients—from the red wine vinegar to the lime juice (leave the olive oil out for now)—to a blender and blend on low until smooth. While the mixture is still blending on low, add the olive oil in a slow and steady stream. This prevents the mixture from separating. Transfer to a bottle or container and set aside. Add the cooked quinoa to a large bowl along with the black beans, toasted pepitas, spinach, avocado, onion, and tomatoes. Add half of the dressing and toss to coat. Taste. If you feel it needs more dressing, add more to your taste. Reserve any leftover vinaigrette for other salads* throughout the week. Garnish with parsley or cilantro and serve as a side or keep it in the fridge for up to 5 days as a light lunch option or snack. Toasting pepitas: Place the pepitas in a dry skillet and heat over medium-low heat, shaking/stirring occasionally to prevent burning, until the seeds are aromatic and turning slightly golden in color. This should take about 3-5 minutes; keep a close eye on them. I made this for lunch today, and we really enjoyed it. I used my Instant Pot, first to toast the pepitas (on saute setting), then to toast the quinoa. After that I added the other quinoa ingredients and cooked them while I prepared the vinaigrette. It worked great! Hey Cathy! I'm so glad you enjoyed this salad. It's one of my favorites. I love that you used the Instant Pot—good to know that worked well for this recipe since I've been trying to get more acquainted with mine. Thanks for taking the time to stop by with feedback! Love the different textures and flavors in this salad. And yes, it's choke-full of nutrients and far from boring!! This sounds absolutely delicious, Dana! Our family is a bunch of quinoa nuts, I think this might become our go-to summer salad! Definitely making this for my lunch next week! Thanks for sharing - I'm always looking for a new take on the quinoa salad. OMG yummmmm! I absolutely love chipotle and have always wanted to find a delicious recipe for a chipotle dressing and here it is! Can't wait to try this salad out this summer! I'm also a fan of quinoa. It's so versatile and nutritious! This is a recipe I certainly must try!